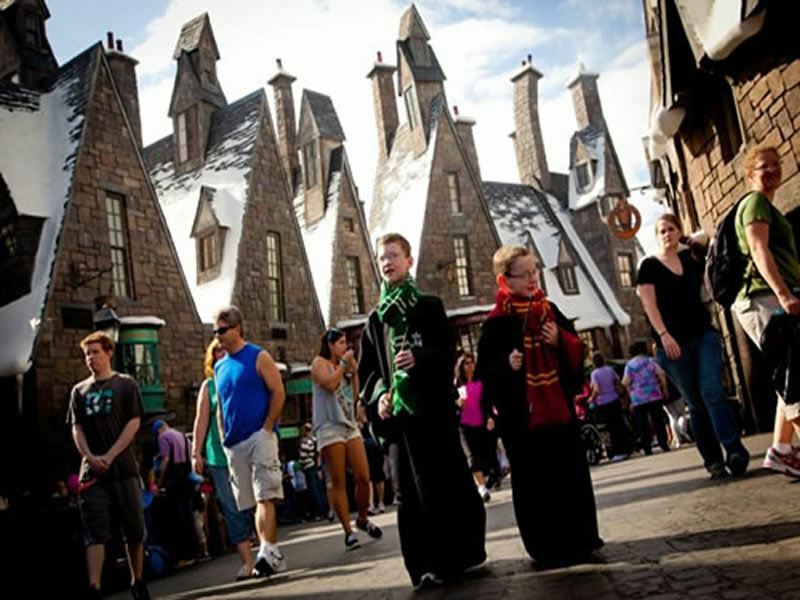 With the Diagon Alley expansion joining the original Hogsmeade attractions of The Wizarding World of Harry Potter at the Universal Studios theme parks, there has never been a better time for a pilgrimage to Orlando, Florida to live a few days in J.K. Rowling’s world. Regardless of whether you choose to park-hop and sample both parks in the same day or devote your entire attention to exploring them one at a time, you definitely won’t want to miss the following sights, sounds, rides, and eats at Hogsmeade in Islands of Adventure. The crown jewel of The Wizarding World of Harry Potter at Islands of Adventure is unquestionably Harry Potter and the Forbidden Journey. Riders get to take a Dumbledore approved, Harry Potter-hosted tour of Hogwarts in a cart that Hermione has bewitched to fly through the castle grounds. It feels like a motion simulator until you fly away from scenes of Quidditch matches and dragon chases and into detailed set pieces complete with Acromantulas, Dementors, and Basilisk skeletons. Even the wait is an unforgettable odyssey through the castle (complete with debates amongst Hogwarts’ outspoken portraits and sage advice from the Sorting Hat). Adrenaline junkies should check out The Dragon Challenge, where they can choose between Hungarian Horntail or Chinese Fireball on these two intense, intertwining roller coasters. Wizards and witches that don’t meet the height requirement for The Dragon Challenge should check out the Flight of the Hippogriff coaster, which is all of the magic minus the G-forces and head rush. My jaw dropped the first time I saw the line for Ollivander’s Wand Shop and the Dervish and Banges gift shop. I found it unbelievable that people would queue up just to go inside and spend money. Here’s what I learned in subsequent visits: Ollivander’s is much more than just a gift shop. After all, “The wand chooses the wizard” – and that’s exactly what happens. One lucky witch or wizard is selected by the shop purveyor to try a variety of wands in search of the one with a magical connection. It’s an unforgettable experience for any young aspiring wizard or witch! Following the wand shop performance, customers are released into the gift shop portion of the building, which happens to be connected to Dervish and Banges. For this reason, it isn’t necessary to wait in line for both. There isn’t an Ollivander-esque performance at Dervish and Banges, though there are school robes, broomsticks, Sneakoscopes, and the caged Monster Book of Monsters. Similarly, Zonko’s joke shop is connected to Honeyduke’s, though these two shops rarely have lines. Muggle visitors will certainly want to bring their appetite and sweet tooth. The signature (and incredibly popular) beverage of the park is Butterbeer, a butterscotch-y cream soda topped with whipped cream and served in liquid or frozen form. In addition to several drink stands throughout this section of the park, Butterbeer is also served at The Three Broomsticks restaurant (a hotspot for shepherd’s pie, cornish pasties, and fish and chips) and the attached Hog’s Head pub (which also serves Pumpkin Juice and alcoholic beverages). For dessert, head over to Honeyduke’s for Chocolate Frogs, Fizzing Whizzbees, Bertie Botts’ Every Flavour jelly beans, and my personal favourite: Cauldron Cakes. I highly recommend that super-fans of the Harry Potter universe take the time to simply walk around the area taking in the sights and sounds. Enjoy performances by students from the French all-girls’ school of witchcraft, Beauxbaton and whimsical songs by Hogwarts’ Frog-choir, equal parts wizard/witch and croaking reptile. The storefronts (even the false ones) also have plenty of magic to witness. I do, however, recommend giving wide berth to the window with the screeching Mandrake root!